Recently, the International Labour Organization (ILO) published the sixth edition of the annual Global Wage Report, which provides comparative information on global and regional wages. The 2018/19 report finds that in 2017, global wage growth fell to its lowest rate since 2008, despite a recovery in global economic growth and a reduction in unemployment in many major countries. In 2017, Africa’s negative wage growth of -3.0 percent contributed to global low wage growth trends. Africa was the only region to experience negative average real wage growth, although some countries in other regions, particularly Latin America and the Caribbean, also faced negative wage growth. 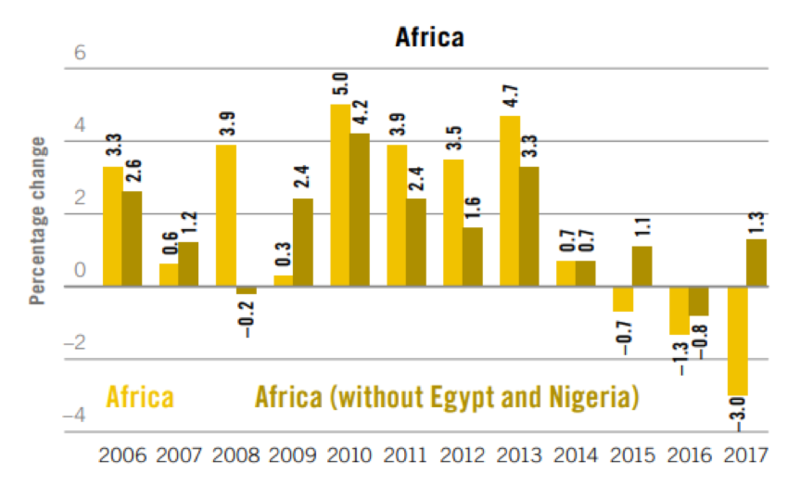 The decrease in average wage growth on the continent was mostly driven by falling real wages in populous Egypt, where currency devaluation led to very high inflation rates, and Nigeria. 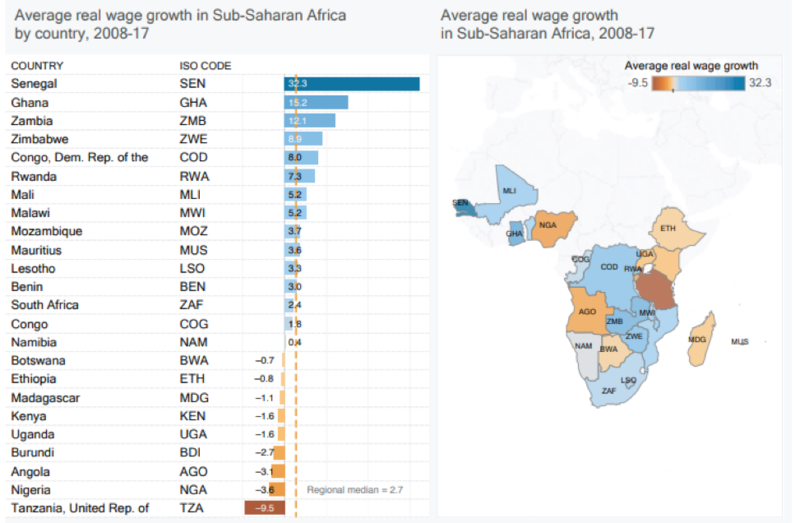 With these two countries removed from the sample, Figure 1 shows that real wages in the rest of Africa moderately increased in 2017, with a slight improvement over the rates of the previous three years. Wage growth remained much lower, however, than during the period from 2009 to 2013, when growth averaged a rate of 3.5 percent. Wage growth rates have varied widely across Africa over the past ten years. As shown in Figure 2, while Senegal, Ghana, and Zambia have all experienced average wage growth rates of more than 12 percent, the East African Community has faced particular challenges, with negative real wage growth in all of its member countries for which data exists. While wage employment is limited in many African countries—the World Bank estimates that only 26 percent of total employment in Africa is comprised of wage and salaried workers—low and stagnant or decreasing wages have still had significant negative effects on a large population of wage employees. Even where growth is positive, the report states that wages in most of Africa remain low. Globalization and technology have contributed to wage and income growth in some countries, but benefits have been uneven; it will be important for African countries to generate further gains in these areas to progress towards wages that are sufficient to adequately cover the needs of workers and their families. Another essential challenge is to ensure that wage growth reaches informal workers. According to the report, some countries have recently undertaken measures to increase wages and strengthen labor protection: South Africa introduced a national minimum wage in 2018, while some recent initiatives have sought to extend protection to vulnerable workers and engage in collective bargaining. African policymakers and civil society organizations should consider pursuing similar initiatives as African economies advance and the proportion of workers who become wage employees increases.